Continuing my series of posts featuring photos taken by iPhone from around Ireland back in 2011. 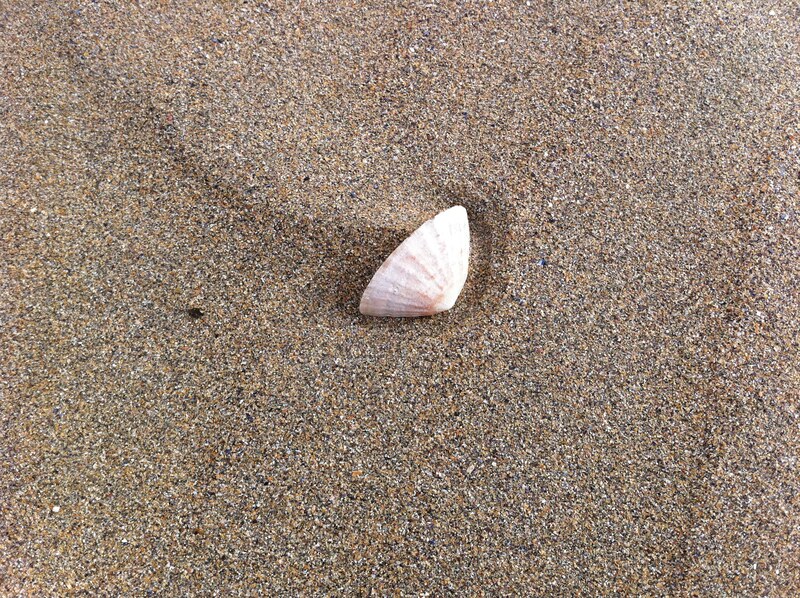 Click here to find the background to this series in the post iReland by iPhone – Part 1 – sTone. 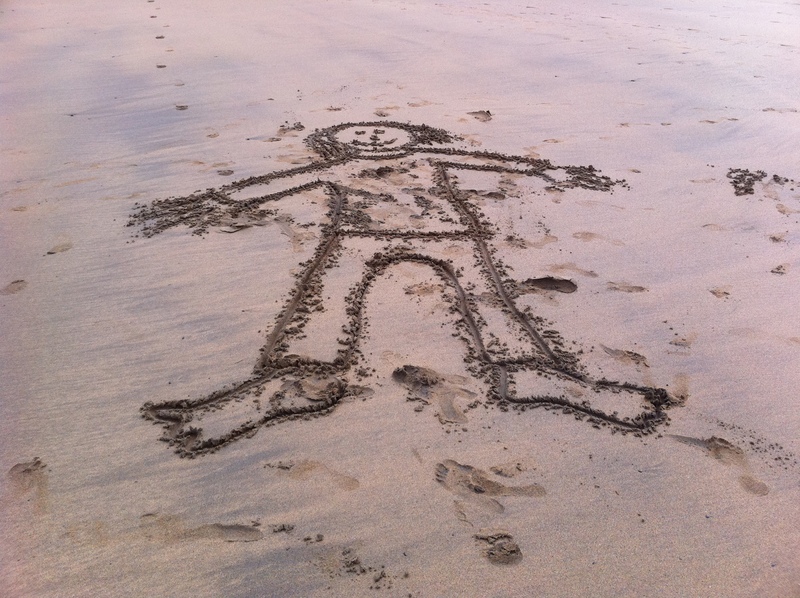 Meanwhile, here is the next installment: sEa and sAnd. Doonbeg is a sandy beach (above), situated on the west coast of Co. Clare, which is in a designated Natural Heritage Area of ecological importance and also a Special area of Conservation (SAC). Above: dramatic late-afternoon sky contrasts with the golden sands on Doonbeg beach, Co. Clare. 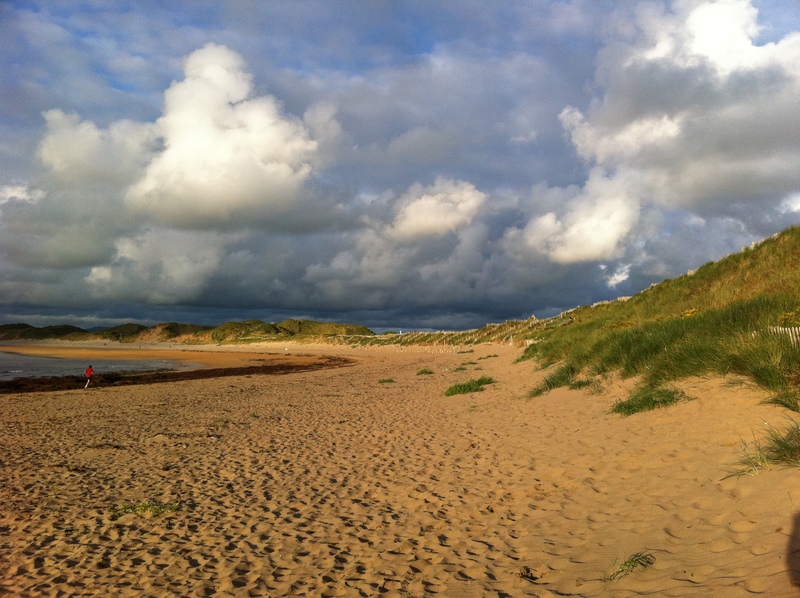 Doonbeg beach is a wonderfully unspoiled amenity popular among locals and tourists alike. It is home to one of Co. Clare’s best surf beaches known locally as “Doughmore”. It is popular among local intermediate surfers as it picks up the smallest swells when none of the surrounding beaches will. It’s remoteness ensures that it is uncluttered. 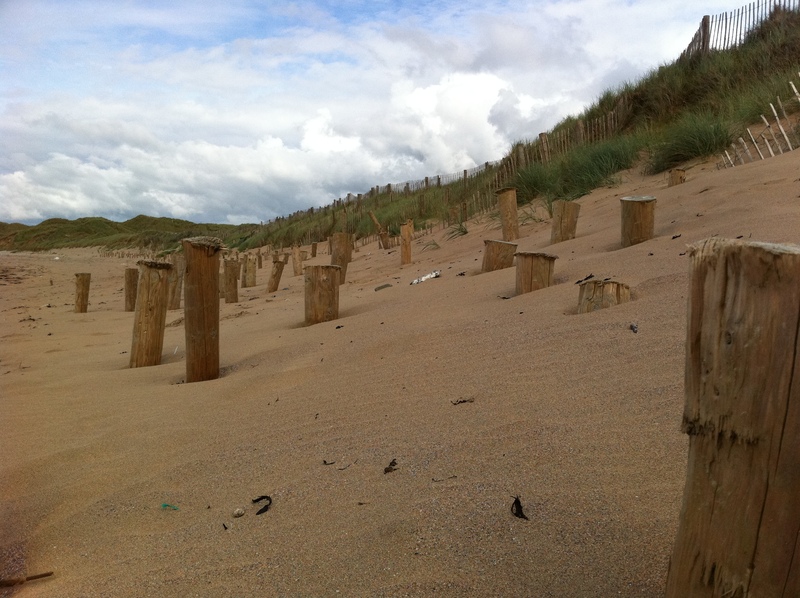 It’s size makes it a tranquil place for a stroll or a jog or simply for children to play in the sand. 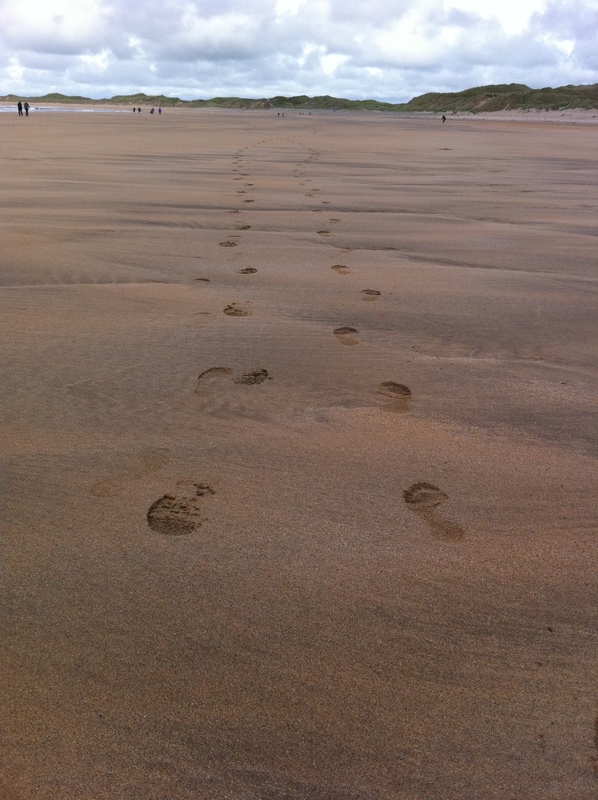 The tranquillity of Doonbeg beach is mainly due to the difficulty of access. 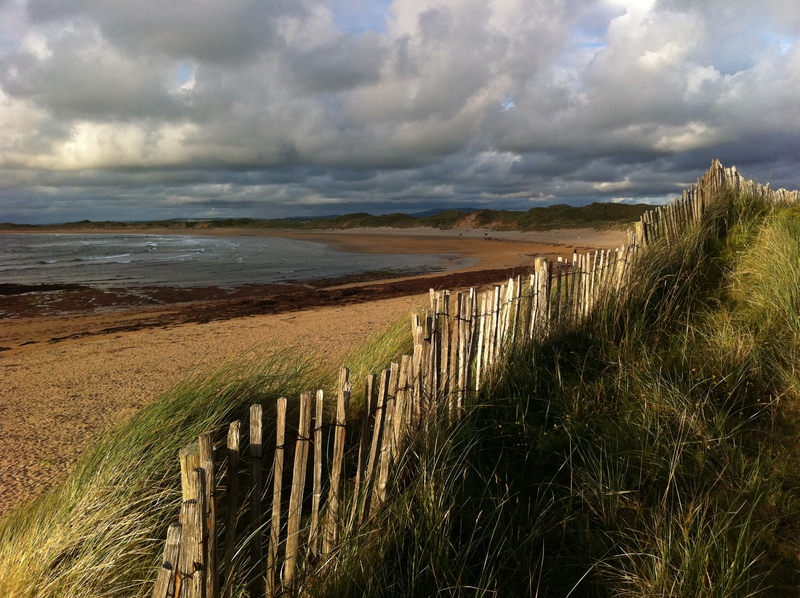 The beach runs parallel to Doonbeg Golf course, designed by Greg Norman, which must be crossed in order to get onto the beach. This view is taken from the edge of the fairway on the 18th hole. 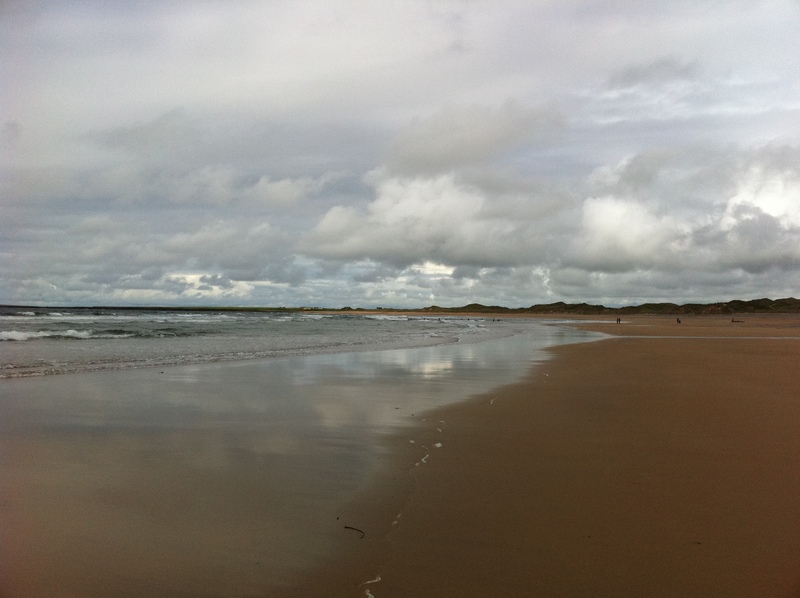 Doonbeg beach, as the name suggests, is close to Doonbeg village (below) in west Co. Clare. 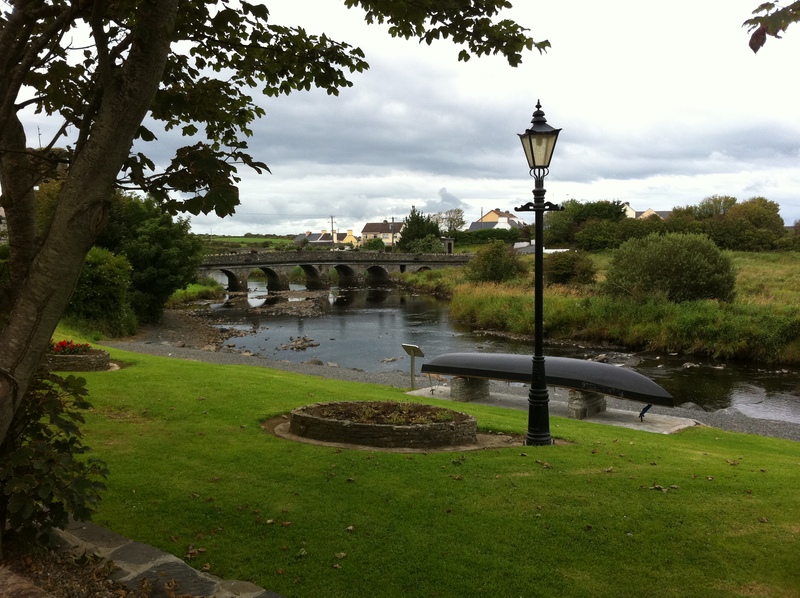 The central point of the village is an architecturally significant seven arched stone bridge which crosses the Doonbeg river and divides the village. A lady called Mary Belfast used to live under one of the arches and the remains of her dwelling exist to this day. 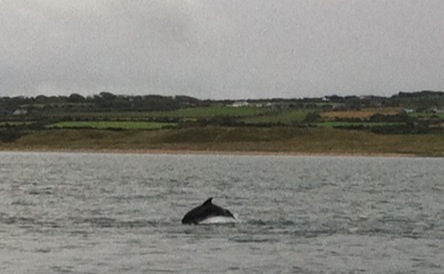 Shannon Estuary is home to around 140 bottlenose dolphins. Dolphinwatch, based out of the village of Carrigaholt in Co. Clare, is dedicated to the conservation of the Shannon dolphins and the protection of their eco-habitat in this Special Area of Conservation. Capturing dolphins with a phone camera is a challenge and these shots do not adequately convey the full extent of how well these wonderful creatures can be observed on a Dolphinwatch trip. 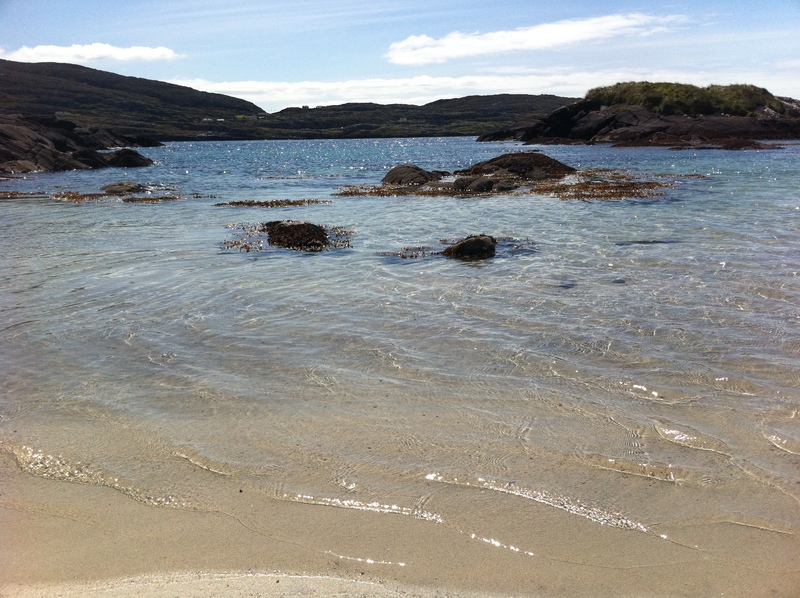 Located in the south-west of Co. Kerry lies the extensive sandy beach of Derrynane Bay. It is regarded as one of the most beautiful and cleanest beaches to be found anywhere in the world. Close by is the village of Caherdaniel, while within a stone’s throw of the beach is Derrynane House (see next page). 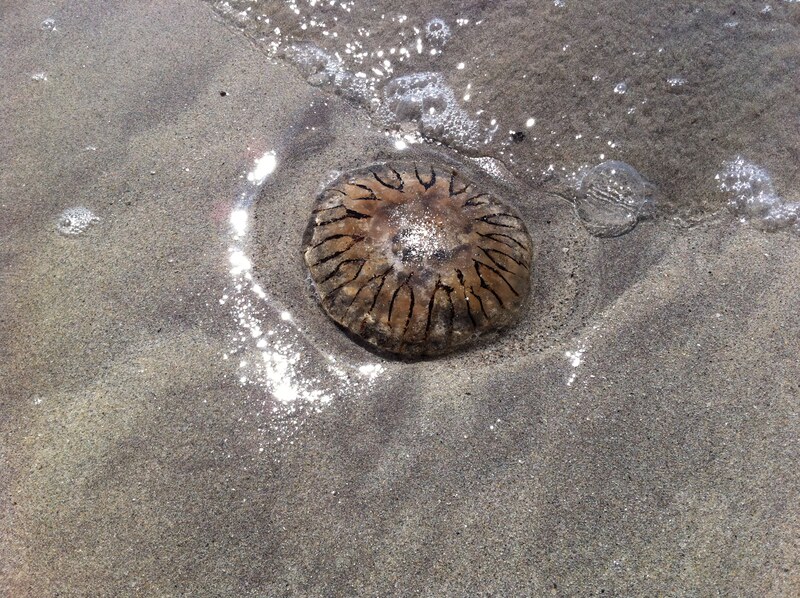 The crystal clear waters provide an opportunity to see tiny fish swimming close to the shoreline as well as many Jellyfish. 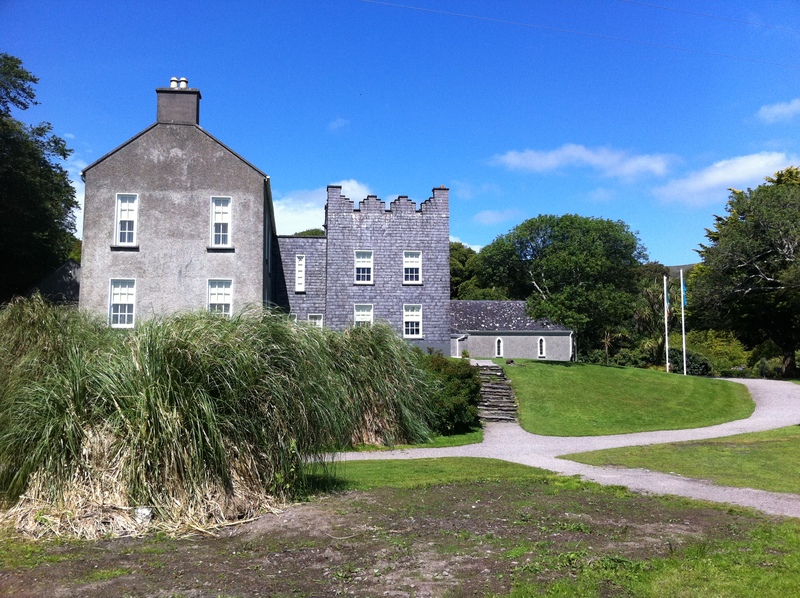 Adjacent to the beach at Derrynane Bay is Derrynane House, former home of Irish lawyer, politician and statesman Daniel O’Connell—”the Liberator”. Situated on 120 hectares of parklands on the scenic Kerry coast, the House displays many relics of O’Connell’s life and career. Beautful John. The key piece of equipment is the mind behind the lens! Thanks Aidy. I fully agree – good composition and use of light will get you a long way in the photography game. While I now use a D-SLR, some of my best (or at least my favourite) shots were taken with the iPhone and my Nikon compact camera. I’ve resisted the urge to splash out on lenses / filters etc – though I suppose I will eventually give in and buy a few ‘toys’! Nice work as usual John. I was pleased to be able to visit Derrynane House a few years back though in truth the Ring of Kerry itself was by far the best bit. Thanks Roy. I never tire of the Ring – and indeed all the wonderful side roads off it!